The 2nd Rotterdam show; really curious what that would bring us. 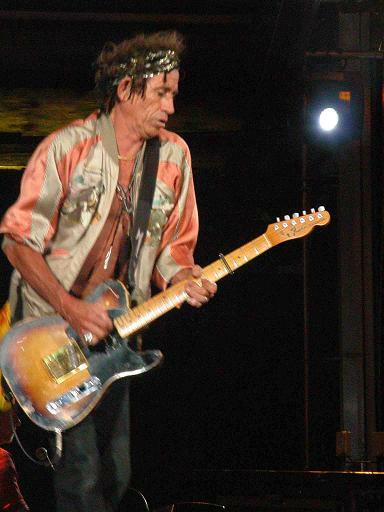 Temperature was way better then two days ago and this time I was at Keith' side in the FOS area, 20 metres from the stage Stones started at 21.15 and ofcourse everyone went completely nuts when Keith entered the stage and doing Brown Sugar. First different song compared with Monday was Angie (instead of Wild Horses). Have to admit that they seemed less inspired than Monday during the first couple of song but thinking of that they surprised me with an absolutely stunning version of Midnight Rambler. Very impressive form the beginning to the end. Great was also The Nearness Of You which is rare for a stadium show; this will probably the last time in a stadium because 95% of the audience don't know this song but hey, this is Holland and you have to do something different. Thanks Keith! The B stage had two new songs which haven't been played on monday: Neighbours and Mannish Boy. They left the B stage after Street Fighting Man. Guess this will be the first song tomorrow in Ahoy. Rest of the show was identical compared to the monday show. Have to admit that I liked the 'new' Gimme Shelter intro on monday but yesterday I realised that I prefer a real intro. Lisa was great though. Holland has now 25 different songs in two days. Ahoy, Vredenburg and two Amsterdam shows to go...... See you friday! This was my third show from the Licks Tour, and only the second time I saw them in my home country. The first time was also in de Kuip in 1995. De Kuip is a great place to see the band, with a great audience and the show was really loud tonight. No big surprises in the set list tonight, but it was terrific to hear Midnight Rambler on the large stage and to hear The Nearness Of You live. The show started at 9.15 with the typical stadium songs Brown Sugar, You Got Me Rocking and IORR. This was followed by Don�t Stop (really getting a good song live). For the rest nice crowd pleasers such as Angie, and a lot of singing from the audience on YGAGWYW. Afterwards maybe the highlight of the evening, a really loud rocking Midnight Rambler, followed by Tumbling Dice. For me a song to go and get some beers. During the band introductions Charlie Watts got the biggest ovation (as usual), he got the microphone, but refused to say anything! Then the two Keith songs, Nearness Of You (I never heard it live before) and Before You Make Me Run. Sympathy For The Devil, with the flames was great as always. We were very close to the B-stage, great view, but the sound was miserable there. The songs were very good however, Neighbours, Mannish Boy and Street Fighting Man. At the final stage we got the hot rocks Gimme Shelter, Honky Tonk Women, Start Me Up and Satisfaction, followed by one encore, Jumping Jack Flash. The sound during the last songs was not so clear anymore, maybe a bit too loud. But for the rest a great show with a great audience. Together with a friend of mine I came from Groningen to Rotterdam where we arrived at five o' clock. We parked the car at a free parkinglot which was five minutes walking from the stadium, perfect! The doors opened at six. We were seated at W-section next to the main stage. It appeared to be the perfect spot, as well as for the view as for the sound. The warming up act was the swinging reggaeband Toots & the Maytals. A great opening act, and of course perfect summer music! The weather was perfect: A nice temperature and no heat tonight, as was the case last Monday which probably caused the somewhat moderate reaction from the audience during that concert (according to a review in the paper). The atmosphere this Wednesday night was awesome: Between the warm up and The Stones all the people in the stadium made a few rounds of a 'wave'. It was a fantastic feeling to be part of such a great crowd. It still remains an event to watch with thousands of people to a gig from the best rock 'n roll band in the world. Anyway... when the intro began to play people got crazy and called for the Stones. And yes, there he was: Keith Richards! He started playing Brown Sugar and then the rest of the band came on stage. The whole stadium immediately went crazy! Keith played very good, no annoying pauses in his rhythm parts (these pauses causes that the rhythm is driven by the drums instead of Keith, which is not the case as you listen to the albums). After this great version came another great rocker: You Got Me Rocking. This song too went great and the audience still went crazy and sang along with it. Ronnie's solo was very good, Keith was great, Mick was in top condition and kept the audience busy, walking and dancing on the whole stage. Next song was the great sing-a-long It's Only Rock 'n Roll. They played it very well with Keith walking towards our section (left side from the stage) playing his solo! The new song Don't Stop with Mick on guitar was also another great performance. Very good guitar work from Mick, Keith and Ronnie. Ronnies' solo was a little soft in the mix but he played it fantastic. Angie! Another treat for the audience. It was getting a little darker and the atmosphere was great while a lot of people put on their lighters and sang along with Mick. Although I thought that Mick had to keep himself in line with some high notes, he sang it beautifully. It was a great version. Like there was no ending with sing-a-long songs we were treated with You Can't Always Get What You Want. For the first time this evening the background singers came on stage: Lisa Fischer, Bernard Fowler and Blondie Chaplin. I didn't miss them on the previous songs I must say. Eventually it all is about the Stones themselves (including Darryl Jones, Chuck Leavell and Bobby Keys)! The band left the audience much room to sing along with them and Mick, of course, lead this treat. When the song finished Mick said to us that we were singing so loud one could even hear us in Amsterdam! Indeed, the crowd was so loud they (me included of course!) sometimes dominated over the band!! Ronnies' solo was a fantastic one, really stunning, the best solo on this song I've heard in a long time. Keith played his part also great, as he was very consistent tonight. I've been to the Stones four times, all of them in Holland: In 1995 Nijmegen, 1998 Amsterdam and The Hague, 1999 Groningen. Up to now I thought of tonights' concert was the best! I have never heard them play so tight. Charlie was fantastic, Keith played very serious and consistent, Ronnie played also great with some great solo's and was the funny guy as always (they both played practically faultless), Mick was absolutely in top of his form! His voice was so sharp and clear and his harp parts were brilliant. I never (saw) heard him sing and play this good live. And then, for me the highlight of the evening: A great rocking version of Midnight Rambler! Ronnie and Keith played at the stage as if they were together in a small room rocking on their guitars, next to Charlie and Darryl. Even the sound/mix was great on this song. As said earlier: Mick played brilliant on his harp and sang his lungs out (well, in a good way of course). The timing was perfect, the song was very tight and rocking. They played a long version and somewhat different: After the first up-tempo they slowed down and seem to be going to the slow blues part, but no... they went rocking and up-tempo again! When they slowed down again they played the bluesy part. Wow, it was really impressive. The timing of Keith, Ronnie with Charlie was perfect! The audience were rocked the joint out! What a treat this song! Up till Midnight Rambler for me it already was the perfect performances from the Stones. The boys were having so much fun and joy. You could clearly see and hear that which resulted in a tight and rocking gig. Tumbling Dice. Well, I've heard this one too often live on stage I think, but the boys played it very well. The sound was not too great on this one. Ronnies' solo was too soft. I still think they should play this number not longer than the original four minutes. Playing any longer it gets boring. Same, by the way, counts for any other standard hit-song like Satisfaction and Jumping Jack Flash. If they played more or less the original time they could easily play other songs during the night. 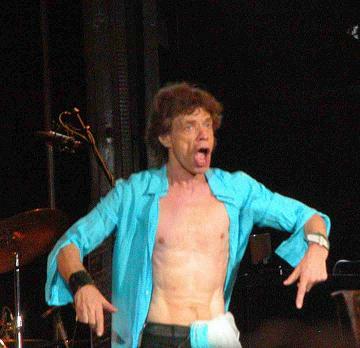 But hey, on the other side: Mick must get the time to run from one side to the other side to the stage etc etc, to please the crowd so to say! Mick did his marathon again tonight! Very impressive for a sixty year old man. Band introductions. Mick introduced us to the bandmembers. When he introduced Ronnie, Ronnie of course being the fun and popular guy, Mick took him by his side and said in Dutch to us: "Ronnie loopt een beetje naast zijn schoenen". "Ronnie is walking great ways", I hope this is the translation more or less. And when Charlie was next, Mick put the microphone to his face but Charlie refused wisely to say a word and instead he jammed on his drums. What a great drummer he is! On with the show. Keith sang his two songs. First the new song Nearness Of You. He sang it very beautifully and soulfully. I have to get used to this song, but it was a great performance. I think the rest of the crowd also 'cause I saw a lot of them talking with each other. My personal favorite of a Keith ballad is Thief In The Night. And then over to the rocker Before They Make Me Run. Strange enough the crowd was not dancing on this song, while this song is another perfect go-along. Anyway, Keith played and sang great and Ronnies' solo during the bridge was perfect. Still, big applause after both songs. And then a visual treat (also musically): Sympathy For The Devil. The lights went beautiful red, which created a great atmosphere. During the percussion sample the crowd sang the Oeehoeeh-part and then Mick began to sing the first verse. And when the chorus started huge flames on the top of the stage were thrown! I instantly felt the heat. It was a great event this song. Too bad the guitars were too soft, so I couldn't hear Keiths' solo's very well. But in my opinion Sympathy was played great, as far as I could hear of course. Small stage! During the moving from the big to the small stage of the band, a sample from Rose Rouge of St. Germain was played. When they arrived on the small stage, Mick said they would play Neighbours and Keith started the first chord. Charlie and Darryl came in and from that moment on, during this song, I practically couldn't hear the guitars anymore... bad soundmix. But still, it was fun to hear and sea this fast rocker live! The sound got better with Mannish Boy. Yeah, this great blues song was really rocking. Mick sang perfect and sharp and played his harp masterfully. Keiths' guitarsound finally was raw like almost in the old days (instead of the too clean sound) and was really rocking! The solo's from Ronnie and Keith together were a bit messy (it could've been the sound of course), but hey... they still rocked this song out to the crowd and Charlie kept the driving rhythm going! Another highlight this evening: A stunning and rocking version of Street Fighting Man. Wow, Keith rocked the joint, it was thrilling to hear him play! His sound was so raw, mean and full (partly thanks to his open guitar tuning of course). He played his part very consistent so it was like he was the rhythm instead of the drums, and that's how I like to hear the Stones! The crowd went crazy like they did all night. The guys walked back on the catwalk to the main stage and a sort of mixed sample started to introduce Gimme Shelter. It was a great sample, but when the band started playing the song, I thought it was not the best version they played. Maybe I was spoiled, 'cause the best live version was played at Paradiso Amsterdam in 1995, which was brilliantly (although the recording is shrill). Fortunately Lisa was fantastic and thrilling on tonights' version! So was Mick. Ronnie and Keith were not that up front. Well, and then the last few songs: Honky Tonk Women, Start Me Up, Satisfaction and the encore Jumping Jack Flash. 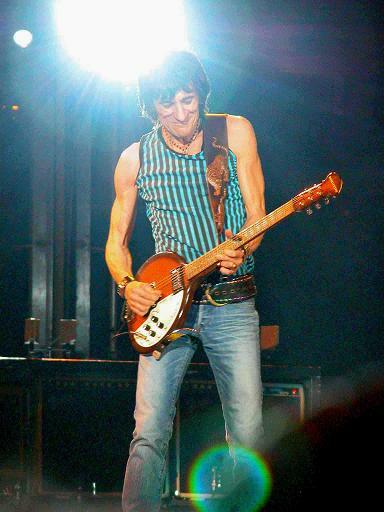 Honky Tonk Women was played perfectly, including Keiths' solo! Start Me Up as well. Both were played not too long, just long enough fortunately. Satisfaction was a long treat, too long in my opinion, but hey... the crowd went crazy of course! After a little break the boys and one girl came back for the encore, a long version of Jumping Jack Flash. During the last two songs Mick was a little soft in the mix (maybe he was finally out of breath after his marathon?) Jumping Jack Flash ended with an extended saying goodbye from the band. I could see that they really enjoyed playing tonight, and that's where I was coming for. For me it was the best live concert of The Stones I've ever seen. They were really tight and consistent and they played with lots and lots of joy. It's unbelievable that these guys are 60. What an energy! I thought also it was a bit intimate like in a club, but maybe that was because I could see them with my bare eyes standing a lot with each other. I also found that the visual effects were supporting instead of being dominant to the music this time. And that was great, 'cause now you really got the idea you went for the music instead of only a huge show. It was an unforgettable evening for me. No lining up allowed before 15.00 pm?!? Not at all! I arrived at the Kuip at 10 am, found some nice people to talk to (and just 7 in front of me! ;-) ) and ejoyed the sunshine all day long. Security walked on by and was friendly. The police never showed up. So much for the curfew, it just didn't exist. The gates opened around 17.45 and I rushed to the fos. Being just 38 and fit like Jagger (god I just wish ...) I was able to pass a lot of the 40+ fans on the pitch and I made it easily, hehehe. I thought they let quite a lot of people inside Ronnies section but once the show started and everyone was on his feet it was actually quite empty inside. I thought they did well on the b-stage but Neighbours and Mannish Boy are not my favorites. Mick took the drumkit and for a second I thought Charlie was going to play Mick's part but that didn't happen of course ;-) After the b-stage the greatest hits brought them home easily. I thought I noticed Jagger had problems with his voice during HTW, any one else on this or was it just me? The review from Mondays show in De Volkskrant (best Dutch quality paper) talked about the missing chemistry between Jagger and the others. I agree that it is Mick who carries the show. He goes from one side to the other and back again and he kept on doing that all night. Charlie was doing his usual stuff and he did that very well (funny thing, during the intros Mick put the mic under his nose, but Charlie just laughed and didn't say a word) and so were Ron and Keith. A wonderfull night, great songs, great audience and warmed up for tonight! Thanks to Marco Peper for the great pictures.